At the beginning of December 2012 I commented that Pixie and I had never received any promo mailers from the Sac & Fox despite the signs they posted when they got rid of all their match play. Since that time, neither Pixie nor I so much as crossed the threshold of that casino. 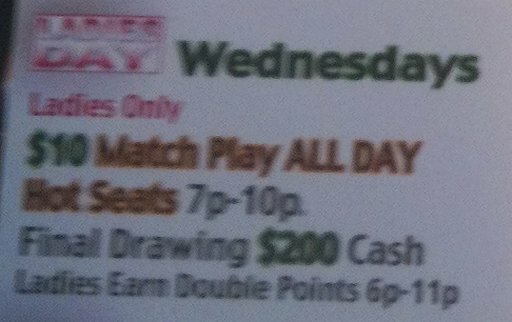 There are other casinos in Shawnee that offer (not very generous) match play and half-assed matchplay (play $20, get $10 and so forth). So why play at the place that offers nothing? And then, interestingly, Pixie got a March 2013 mailer from them. Her mailer consists of a whole array of $5.00 free play coupons, all with different dates in the month of March. Patiently I explained that I had thought so, too, but that someone I knew had just gotten a mailer and we had neither one of us been into the casino since November, I just wanted to be sure about the address. By this time I was getting pretty tired of the snotty service. But I just asked her, again, patiently, if she’d please just verify my mailing address. Finally she did, checking her screen and reading back to me my correct mailing address. So, that’s the scoop, people. The player’s club at the Sac & Fox is claiming, rather rudely, that they only send mailers to people who have been playing recently. It’s not true. But we don’t know what other criteria they may be using. And apparently the player’s club reps don’t know either, or have been instructed not to give good info if they do know. On the bright side, I noticed a new bank of brand-new AGS “Pay It Again” video poker machines, which would be the newest video poker machines in Shawnee and the only ones that aren’t ancient and horrible Game Kings. According to this page, the worst payout option available from the manufacturer of that machine is 96.92%, which means it would be a fairly inexpensive seat from which to rack up a lot of play. (That’s a poor return for a serious video poker player, but I strongly suspect it’s better than the default slot machine percentages in that casino.) So, now that Pixie has coupons, we may go back and give them a little bit of business while I see how much poker I have to play to start getting coupons of my own. 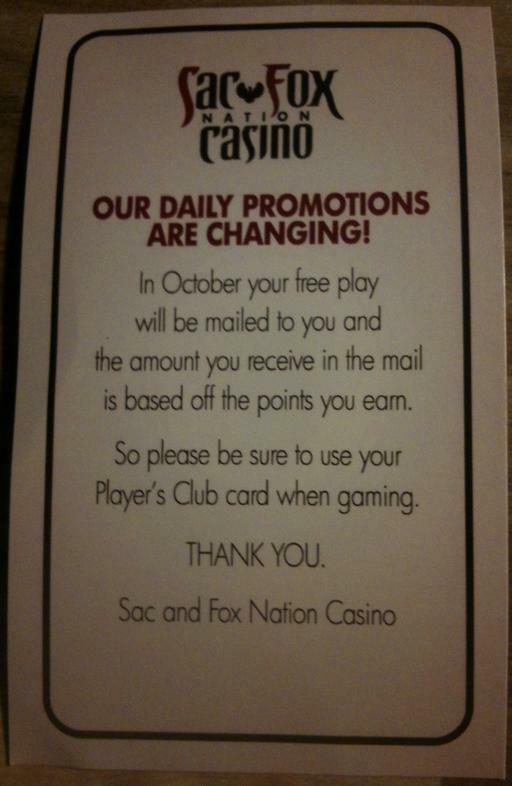 Remember when the Sac & Fox casinos had their match play taken out and shot, back in early October? At the time they promised that match play coupons would be mailed out. Pixie and I haven’t seen any as of December 1. Have you? Please comment if so. Thursday night (November 29) we were passing by the Sac & Fox Shawnee casino around midnight so we decided to drop in for giggles and see what they are currently advertising for promotions. The place was like a post-apocalyptic wasteland; the parking lot was so empty we literally thought the place was closed. Inside, it was nothing but bank on bank of lonely slot machines. Recent changes: some machines were torn out in the middle of the casino, and there was carpentry equipment stacked there. A sign says that table games are being installed. Another construction sign shows an artist conception drawing of the casino facade with new signage and lights, indicating that there’s to be exterior renovation as well. The only December promotion being advertised was an extremely stingy card swipe scheme. No free swipes for anybody; you have to show up during a fairly narrow time slot on Saturday afternoons in December, earn 50 points (which means “wager fifty dollars” at this casino although they won’t say so if you ask them) and then swipe your card at the player’s club for a 1-in-20 chance to win a prize. The prizes are not itemized but include a few tech gadgets (like televisions) and unspecified amounts of play (I’m not sure if it was free play or match play, I forgot to take notes) in amounts “up to” $500. For each additional fifty points you earn, you also get another swipe. I call this promotion “extremely stingy” because of math. 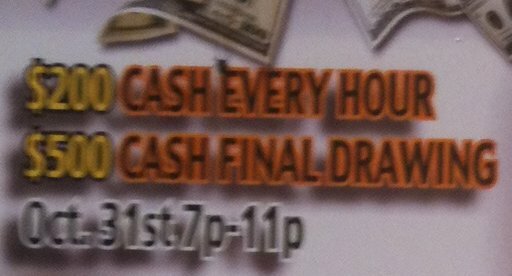 First of all, I think we can safely assume that “up to” means that most prizes will be “less than” $500. But even if we assumed that all prizes were worth $500 (and some of the tech prizes clearly are not) that would still work out to a $50 investment to earn a prize chance worth $25 ($500 divided by 20). That’s like the “half-assed match play” bet-$20-get-$10 promotions at the Seminole casinos and the Fire Lake Grand. It would be worth playing this promotion if all the prizes really were valued at $500; but the actual prize distribution is not published, and I think we can safely assume that a lot more people will be winning $5 or $25 or $100 than will be winning $500 in play or expensive tech gadgets. If you are putting $50 at risk to earn a prize chance worth $.25 ($5 divided by 20) that’s hardly worth getting out of bed for. It’s been funny to observe how empty some of the casinos have gotten recently after abandoning popular promotions. I wonder how long they will be content to sit empty on Thursday nights before they come to understand that promotions are what get people to get in their cars and make the long drives to come and gamble? But by the time I got to the casino, I was very short on time. No worries; $20 in wagers doesn’t take long. So down I sat at an Invaders From The Planet Moolah game. 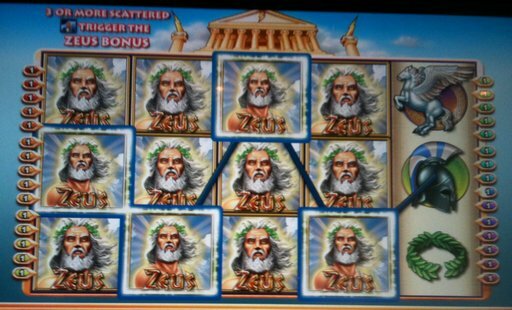 I’d played a couple of bucks when the screen went insane — the middle three columns were all (or mostly) wilds. The “Big Win” siren went off and the line pay was $32. Sweet! And then it was time for the winning tiles to clear and the cascade to happen. All three middle columns came in wild AGAIN and the Big Win siren was wailing again too. This time it was a bit less than $30, but I wasn’t complaining. Right then my phone rang with errands-related stuff. Now I was officially in a hurry to finish up and get out of there. So I doubled my bet. And kept winning, in smaller ways. By the time I’d earned my promo play, I was up about $80 in total. $10 dollars in promo? Let’s do 11 spins at ninety cents a spin and get out of here. A profitable choice. I got two more nice little hits in those 11 spins, and wound up cashing a ticket for almost $120. Total time in the casino: less than 15 minutes. It is the editorial position here at Okie Gamblers that when Oklahoma casinos fail to honor their advertised match play, we should do our best to publicize that behavior. The only way to incentivize casinos to behave better is to call them out when they deal unfairly. That’s an unequivocal offer for $10 match play for ladies on Wednesdays in October. So, on Wednesday October 31 we stopped in. I went to talk to the Silver Swords machine while Pixie went to put her $10 in the Skee-Ball game. She played her $10. The little blue coins did not light up. You could deduce from that — I guess — that the Halloween drawings might replace the (less generous) Ladies Day drawings scheduled for the same day. Although I have been to plenty of other casinos that have special drawings going on simultaneously with their regularly scheduled weekly promotions. In any case, we weren’t there for the drawings, and we weren’t expecting both sets to be happening. However, there’s nothing about that Halloween advertising that hints or suggests that the Ladies Day match play would not be offered as advertised. So once Pixie learned she wouldn’t be getting her promotional play, she was DONE. I imagine she’ll get over it eventually, but she hasn’t yet. And she didn’t have any interest in playing through the thirty or forty bucks we usually put at risk when we go there. So I cashed out my winnings of the moment (about $20) and we got the heck out of there. Insult to injury: Holdenville doesn’t have a ticket-cashing machine, so to cash my ticket, I went to the cashiers window (located at the very back of the casino). On the glass in front of the cashiers were a pair of very tiny (index-card-sized) signs, which said something like “No Ladies Day Match Play Today” (I’m working from memory). 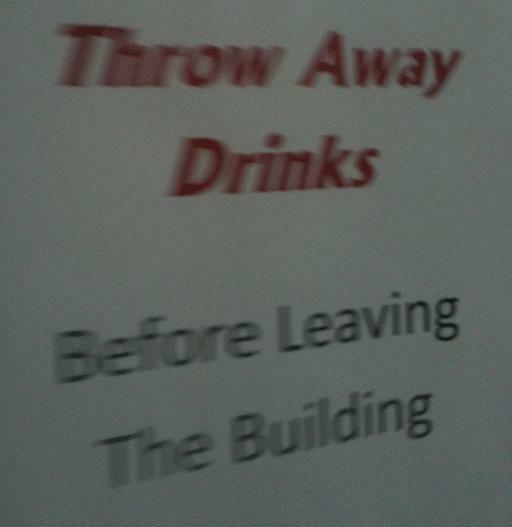 So somebody in casino management knew this was a problem that gamblers would want to know about, but they buried the notice at the very back of the casino, where you won’t likely see it until you are cashing out before leaving. Was there any sign on the entrance doors, or near them? We checked on our way out, but you already know the answer: there was not. We got screwed. It was the last weekend of the month, and they apparently had decided not to continue the month-long promotion to the end of the month. Instead, they wanted to start people working on earning entries for their newest drawings promotion. People who drove to play at their facility based on the advertised offer? Just out of luck. The casinos make the rules, they are effectively unregulated (or self-regulated, which amounts to something very similar), and they all have “We reserve the right to change or alter promotions at any time” weasel words prominently posted somewhere. There isn’t a thing that we, the gambling consumers, can do about this. In legalese, there’s no available redress when we are wronged by a casino that chooses not to honor its advertised promotions. However, it’s still sleazy and wrong and shameful. Oklahoma casinos are fundamentally rural. There is a lot of open space in Oklahoma, and people use promotions in deciding where to go and how far to drive. Gasoline is expensive and our time is valuable. If you advertise a promotion, you should honor that promotion. Furthermore, in the event that a promotion is altered or eliminated, there should be substantial efforts made to alert the gambling public. Websites and recorded telephone messages advertising the promotion should be changed, and there should be prominent signage at the casino entrance alerting consumers to the change. The only things we gamblers can do to “enforce” this standard is to take our gambling dollars to the casinos that play fair, honor their advertised promotions, and strive mightily to alert gamblers when an advertised promotion will not be honored for some good reason. And to do that, we need to have some way of knowing which casinos fall short of that standard. It’s our intention here at Okie Gamblers to document the shady promotional practices we experience, and we encourage our readers to email and comment regarding any such problems they have encountered.